According to the current standards synthetic kerosene must be blended with conventional hydrocarbons or Jet A or Jet A-1 before it can be released as jet fuel. Besides a certain volumetric limit jet fuel specifications define a set of (additional) properties a blend must fulfill for certification. Thus, a proper selection of matching synthetic and conventional fuel batches for blending (“matching blendstock”) will be of significant importance at some point in the future aviation fuel supply chain. If the properties of the involved batches are unfavorable, the maximum allowable blending ratio may not be achievable. Yet from a technical point of view, even blending ratios beyond the currently specified limit could be possible, if two favorable batches were chosen. Surveys have shown that properties of conventional kerosene vary considerably within the prescribed range of the specification. 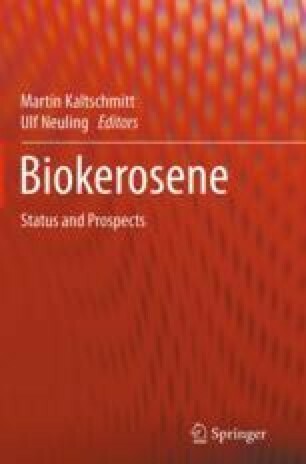 Against this background this chapter first provides an overview of the main types of molecules present in kerosene in order to illustrate their influence on fuel properties. Afterwards conventional and synthetic kerosene are characterized in detail. Finally, the most relevant properties for blending are identified for a wide variety of synthetic and conventional kerosene.